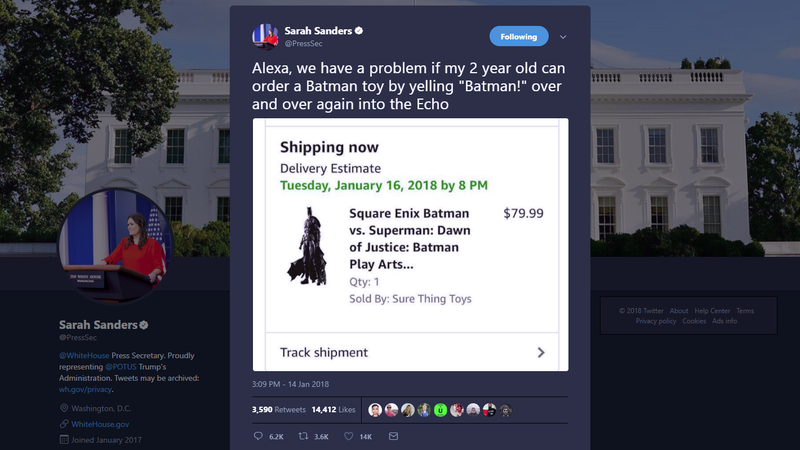 On Sunday, White House press secretary Sarah Huckabee Sanders used her official government Twitter account to complain that her two-year-old had allegedly ordered a $79.99 action figure by “yelling ‘Batman!’ over and over again at her Alexa-enabled Amazon Echo. If this were true, it would certainly be a convenient way for Sanders to score some points with her boss, who has repeatedly accused Amazon of not paying fictional “internet taxes” (a confused reference to state sales tax), being a tax shelter, and screwing over the U.S. Postal Service on delivery rates. Also, it would be very bad if a two-year-old repeatedly screaming “Batman!” could in fact end up with an account owner being charged $79.99 for a toy. However, Sanders’ tweet did get her a completely fact-check-free shoutout by one of the president’s favorite right-wing talk shows, which is probably worth the time it takes to place an $80 order, screenshot it, and then cancel it. There are good reasons to be wary about setting up a voice assistant-enabled ad machine in your house, especially one where a two-year-old might be roaming. But Sanders’ account just doesn’t add up, because of course it doesn’t.